Good morning crafty peeps...hope you all had a good nights kip.awoke to the .birds singing their little heads off this morning with overtones of fresh cut grass..and the noiseiest mower in the world..**THE COUNIL** cutting the verges what a flamin racket..not the birdies though and i have a headache already plus reckon i slept too heavy me thinks..anyway must not prattle on too much and here is a card i made last night its a D'Arcys digi arnt they the cutest..coloured in with my new copics wish now id done a different colour on one of the girls..but never mind enjoyed colouring them in i added a die cut frame from ebay ..added a sassy bow with a new pink pin i made yesterday a tiny postcard with a rub off had these ages.years....wasnt even sure they would rub off ..but there still ok.they are from Pebbles inc..must go and have a look if i can find some new ones as i rather like the font....papers are fromK&Co Designer pack and flowers from Wild Ochids...i think this has a bit og a vintage feel im popping her into a comp over at http://darcysdiaries.blogspot.co.uk/ lace and ribbon challenge...right its hi ho !!! its off to work i go..mwah sees yer laters sassy hugs and thanks in advance if you leave me a much appreciated comment....will be blog searching later to drool and oooo and r over your fabby works.. Simply gorgeous card Sassy. You are right about the vintage feel - love all your gorgeous details. Thank you for joining us at D'Arcys. Thanks for joining us at D´Arsy´s! 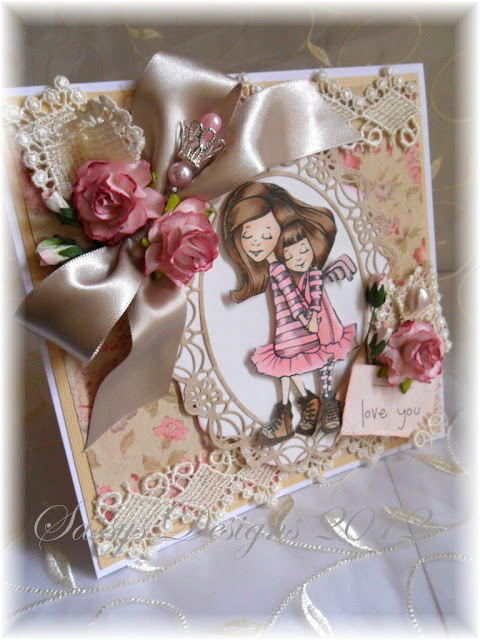 Fantastic card Sassy and it defintly fit into our ribbon and lace challenge this week with all your lovely embellishments! This is gorgeous sweetie I love these images. So cute, Sue, love the image and the huge bow is fantastic! Oh wowwwww this is just stunning Sassy!!! Gorgeous details - love your card!! This is Stunning i love the yummy lace. OOOOO this is just so beautiful, I love your use of lace and those beautiful flowers too. Your colouring of D'Arcy is just amazing. Thanks for playing along with us at D'Arcy's Diaries this time.